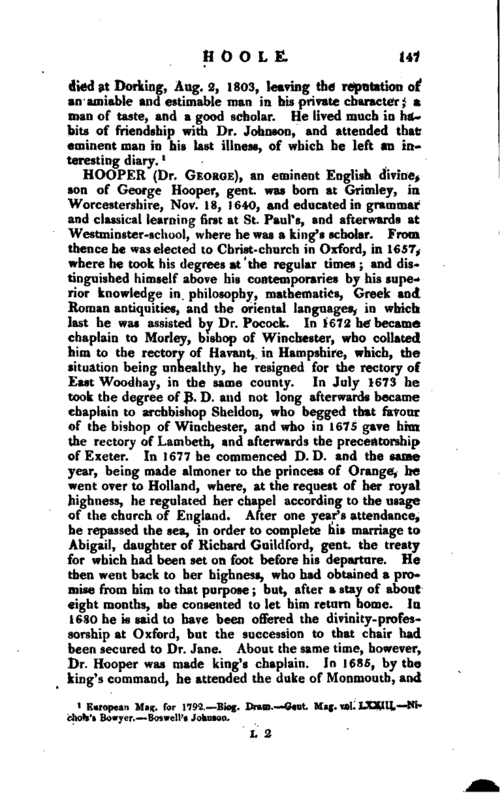 , an eminent English divine, son of George Hooper, gent, was born at Grimley, in Worcestershire, Nov. 18, 1640, and educated in grammar and classical learning first at St. Paul’s, and afterwards at Westminster-school, where he was a king’s scholar. From thence he was elected to Christ-church in Oxford, in 1657^ where he took his degrees at the regular times and distinguished himself above his contemporaries by his superior knowledge in philosophy, mathematics, Greek and Roman antiquities, and the oriental languages, in which last he was assisted by Dr. Pocock. In 1672 he became chaplain to Morley, bishop of Winchester, who collated him to the rectory of Havant, in Hampshire, which, the situation being unhealthy, he resigned for the rectory of East Woodhay, in the same county. In July 1673 he took the degree of B. D. and not long afterwards became chaplain to archbishop Sheldon, who begged that favour of the bishop of Winchester, and who in 1675 gave him the rectory of Lambeth, and afterwards the precentorship* of Exeter. In 1677 he commenced D. D. and the same year, being made almoner to the princess of Orange, he went over to Holland, where, at the request of her royal highness, he regulated her chapel according to the usage of the church of England. After one year’s attendance, he repassed the sea, in order to complete his marriage to Abigail, daughter of Richard Guildford, gent, the treaty for which had been set on foot before his departure. He then went back to her highness, who had obtained a promise from him to that purpose; but, after a stay of about eight months, she consented to let him return home. In 1680 he is said to have been offered the divinity-professorship at Oxford, but the succession to that chair had been secured to Dr. Jane. 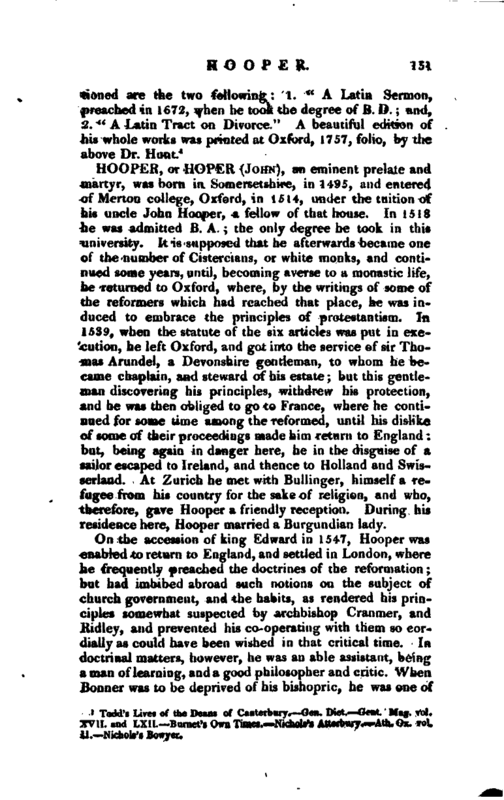 About the same time, however, Dr. Hooper was made king’s chaplain. In 1685, by the king’s command, he attended the duke of Monmouth, and | had much free conversation with him in the Tower, both the evening before, and the day of his execution, on which, that unhappy nobleman assured him “be had made his peace with God,” the nature of which persuasion Dr. Hooper solemnly entreated him to consider well, and then waited on him in his last moments. The following year he took a share in the popish controversy, and wrote a treatise, which will be mentioned presently with his works. In 1691, he succeeded Dr. Sharp in the deanery of Canterbury. As he never made tae least application for preferment, queen Mary surprised him vvitn this offer, when the king her husband was absent in Holland. With a disinterestedness not very common, he now proposed to resign either of his livings, but the queen observed that though the king and she never gave two livings to one man, yet they never took them away,“and ordered him to keep both. However, he resigned the rectory of Woodhay. He was made chaplain to their majesties the same year. In 1698, when a preceptor was chosen forttie duke of Gloucester, though both the royal parents of that prince pressed earnestly to have Hooper, and no objection was ever made against him, yet the king named bishop Burnet for that service. In 1701, he was chosen prolocutor to the lower house of convocation and the same year was offered the primacy cf Ireland by the earl of Rochester, then lord-lieutenant, which he declined. In May 1703, he was nominated to the bishopric of St. Asaph. 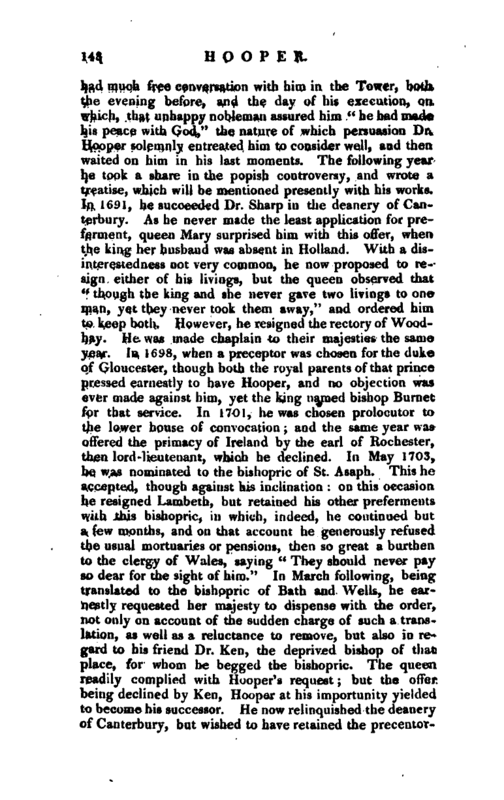 This he accepted, though against his inclination on this occasion be resigned Lambeth, but retained his other preferments with this bishopric, in which, indeed, he continued but a few months, and on that account he generously refused the usual mortuaries or pensions, then so great a burthen to the clergy of Wales, saying” They should never pay so dear for the sight of him." In March following, being translated to the bishopric of Bath and Wells, he earnestly requested her majesty to dispense with the order, not only on account of the sudden charge of such a translation, as well as a reluctance to remove, but aiso in regard to his friend Dr. Ken, the deprived bishop of that place, for whom he begged the bishopric. The queen, readily complied vvitb Hooper’s request; but the offer being declined by Ken, Hooper at his importunity yielded to become his successor. He now relinquished the deanery of Canterbury, but wished to have retained the | precentorship of Exeter in commendam, solely for the use of Dr. Ken. But this was not agreeable to Dr. Trelauney, bishop of Exeter. His intention, however, was supplied by the bounty of the queen, who conferred an annual pension of 200l. on the deprived prelate. In 1705, bishop Hooper distinguished himself in the debate on the danger of the church, which, with many other persons, he apprehended to be more than imaginary. His observation was candid; he complained with justice of that invidious distinction which the terms high church and low church occasioned, and of that enmity which they tended to produce. In the debate in 1706, he spoke against the union between England and Scotland, but grounded his arguments on 'fears which have not been realized. In 1709-10, when the articles of Sachevereli’s impeachment were debated, he endeavoured to excuse that divine, and entered his protest against the vote, which he could not prevent. But, whatever were his political opinions, his prudent, courteous, and liberal behaviour in his diocese, secured the esteem both of the laity and clergy. To the latter he was a faithful friend. For while he confined his preferments to those of his own diocese, his disposal of them was judicious and disinterested. The modest were often dignified without any expectation, and the diligent were always advanced without the least solicitation. 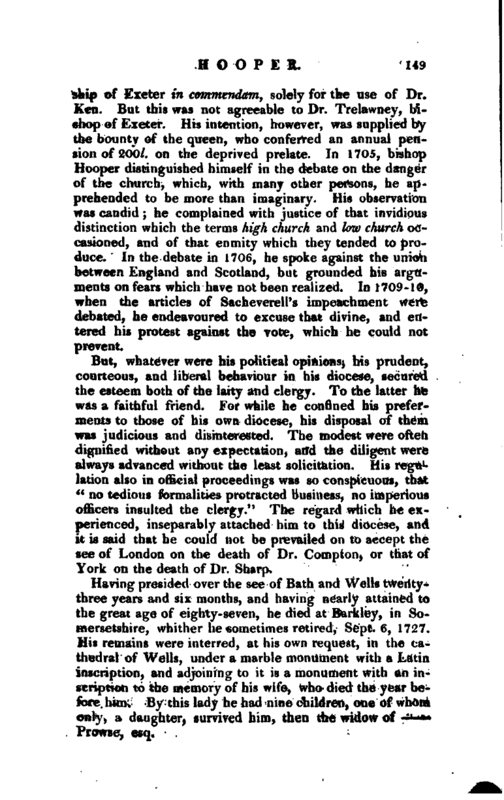 His regulation also in official proceedings was so conspicuous, that “no tedious formalities protracted business, no imperious officers insulted the clergy.” The regard which he experienced, inseparably attached him to this diocese, and it is said that he could not be prevailed on to accept the see of London on the death of Dr. Compton, or that of York on the death of Dr. Sharp. Having presided over the see of Bath and Wells twentythree years and six months, and having nearly attained to the great age of eighty seven, he died at Barkley, in Somersetshire, whither he sometimes retired, Sept. 6, 1727. His remains were interred, at his own request, in the cathedral of Wells, under a marble monument with a Latin inscription, and adjoining to it is a monument with an inscription to the memory of his wife, who died the year before him. By this lady he had nine children, one of whom only, a daughter, survived him, then the widow of Prowse, esq. 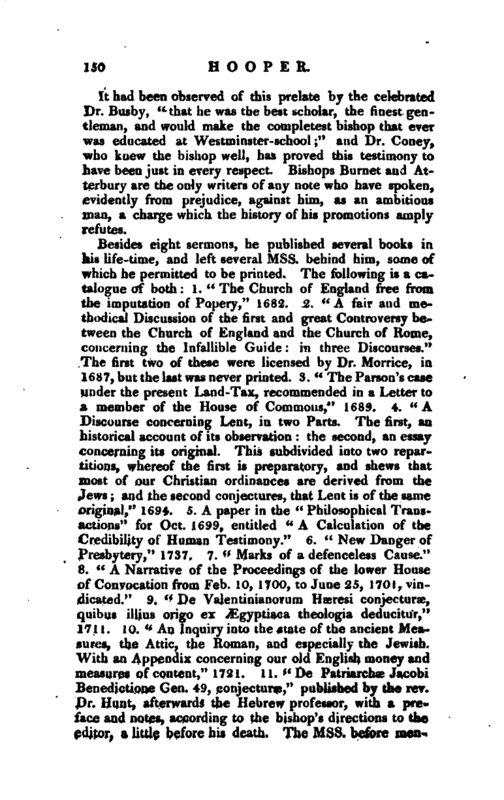 | It had been observed of this prelate by the celebrated Dr. Busby, “that he was the best scholar, the finest gentleman, and would make the completest bishop that ever was educated at Westminster-school;” and Dr. Coney, who knew the bishop well, has proved this testimony to have been just in every respect. Bishops Burnet and Atterbury are the only writers of any note who have spoken, evidently from prejudice, against him, as an ambitious man, a charge which the history of his promotions amply refutes. Todd’s Lives of the Deans of Canterbury. Gen. Dict. —Gent. Mag. vol. XVII. and LXII. Burnet’s Own Times. Nichols’s Averbury. —Ath. Ox. vol. II. Nichols’s Bowyer.